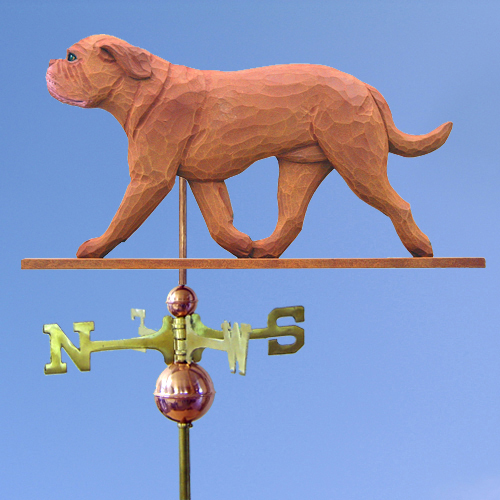 Dogue de Bordeaux Dog Weathervane, hand carved in basswood by our master woodcarver. It is available in two sizes: 22" or 32". Slight variation on height dimension will depend upon breed. Our Dogue de Bordeaux dog weathervane is fully functioning and weather resistant - hand-carved from Basswood, sealed and hand-painted. A durable top finish insures vibrant colors for years to come. This purchase also includes the copper spacer balls, a rod, the directionals and ring. Made in the USA. Hawaii, Alaska and International Customers - please contact us for ordering and shipping cost information.